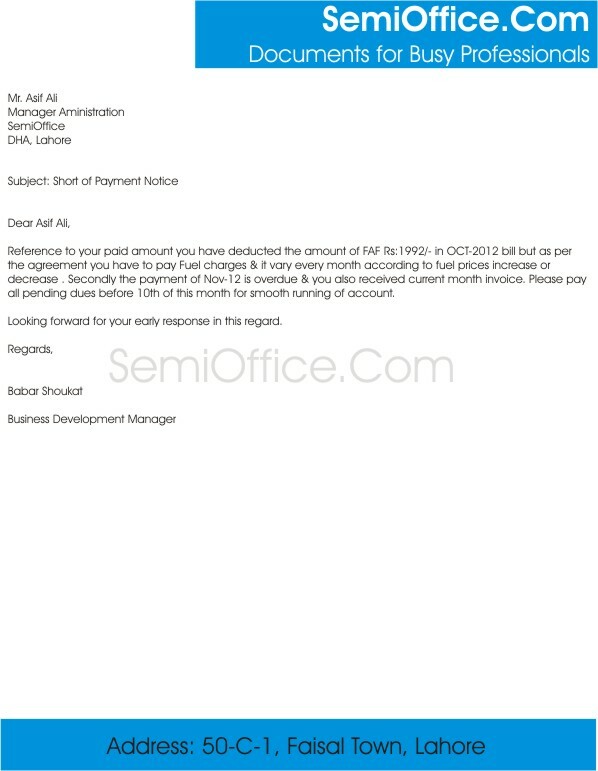 Short of Payment Letter notice for Recovery from company clients, customers, distributors, card holders. Best recovery letter for bank, insurance and financial institutions for credit recovery letter, debt recovery letter or payment recovery letter from customers, clients, business partners, etc. I am writing to you because I would like to discuss the missed payment that your company has failed to pay. I would like to remind you of the bill due date. You have to pay one the third of every month. Due to you missing the bill due date last month I would like you to pay early before this date for the month that you have missed and for the upcoming month. Your bill number is 4827 49832 date before 03.07.16 the amount is three hundred thousand pounds 150 000 for one month and 150 000 for next month. If you fail to pay this by the due date then we will have no choice but to go to court and get a court order to take by force if you can’t give us by money then we will take your property with that same value as what you owe us. I’m sure that you don’t want this any more than we do so I hope that you are able to pay this and we don’t have to go any further. I look forward to hearing back and seeing what you have to do. Reference to your paid amount you have deducted the amount of FAF Rs:1992/- in OCT-2016 bill but as per the agreement you have to pay Fuel charges every month according to fuel prices increase or decrease . Secondly the payment of Nov-16 is overdue & you also received current month invoice. Please pay all pending dues before 10th of this month for smooth running of account. Looking forward for your early response in this regard. I am writing this to remind you that your payment date for the consignment, which we sent you on Saturday 22 January, has elapsed. We have not received your payment yet. This is to further inform you that we provide a time of one month to our valued customers for payment. Your deadline was on yesterday. Kindly, ensure that the payment is credited to our account as early as possible so that we can continue working together in the future. And, make sure to refrain from delayed payments in the future. Nice I got one here. Please i need some template which I couldn’t find on other website, how can you be of help?